Hey. :) Welcome to our book about how to make a platformer game with Cocos2D-X. This book will teach you how to make a complete game from scratch and publish it yourself. This book will walk you through all the basics steps of how to write game code, make art assets and build your own cross-platform game. What will you need to know to make use of this tutorial? Some familiarity with the C++ programming language. Some familiarity with an IDE like Xcode, Visual Studio or Eclipse. Please note that this is an iterative book. As the open-source Cocos2D-X game engine grows it gets better and better, causing us to enhance this book. A changelog will be maintained so you can always see what's new. 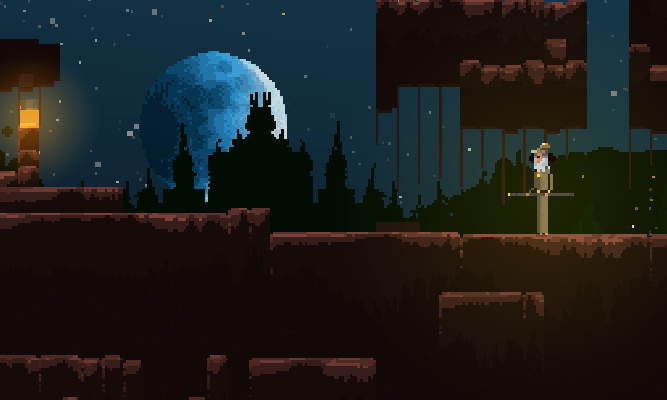 We hope you enjoy learning about making your own multi-platform sidescroller game! Great! I hope that you will folllow format from Cocos2d book written by Apress. Hope to see how to create tile based game that works on all platforms. I think this must be a very good way to learn cocos2d-x!!!! Looking at the chapters, this is going to be a good book. Lots of new stuff I have been wondering about. Looking at the chapters, this is going to be a good book. So has this project been abandoned?? Nope. August has been a busy month for me with one week of vacation already and another coming up. Rest assured, I have two new chapters of the book almost finished. One will be released this week and one next week. So while progress might be a little slower in August, the normal pace of a chapter a week will be resumed in September. The goal is to make this Cocos2d-X book & source code high quality and lasting. A solid reference for years to come. Any news on more chapters? I bought Paralaxer on 7/2 and am anxious to get through the book. Stephen, yeah, the new chapter on setting up your projects is almost done. It’s taking a long time because A) it’s one of the biggest chapters yet, and B) the new Paralaxer 1.0.3 with Cocos2d-X 2.0.2 and iOS6 support is quite a time-consuming update. So, look for the new chapter and the 1.0.3 download really soon. Possibly tomorrow (Sunday). When the new chapter “Projects & Build Scripts” will be released? Waiting for the chapter for so looooooooooooooooong. Sorry for the wait! I was quite busy updating Paralaxer to version 1.0.3, incorporating Cocos2dx 2.0.2 and iOS 6. Then I had to update my other two kits to Cocos2d iPhone 2.0 and iOS 6 as well. These all were pretty major updates and took a lot of time to make sure they worked correctly on iOS 6, 5, 4.3, Xcode 4.3, 4.4, 4.5, Windows, Android, etc.! Anyway, this new chapter on build scripts is going to be a big one. I have it about 25% finished and ought to be able to wrap it up tomorrow (Saturday). Cheers and thanks for writing. Awesome! Thank you for the hard working of the new chapter on setting up a cocos2d-X meta-project. Yes, there is already a PDF version included when you purchase the source code package. Your email subscriber is really nice, but why don’t you provide real RSS? I prefer my RSS-Reader over a flooded mailbox. Hi NobbZ, a link to the RSS feed has been added above, near the email subscribe. Thanks for writing.